FAST Defence is the latest evolution of personal protection/conflict resolution called adrenal stress response training. We train you how to control the adrenal stress response that anyone gets in a confrontation, whether it is a small verbal engagement or a physical attack, and even to use this powerful emotional bio-chemical response as an incredible source of power! Adrenal stress in one form or another occurs in every confrontation, however big or small. From aggressive behaviour in the workplace to a mugging or violent attack on the street, the body is flooded with adrenaline. The biggest factor in self-protection is having the ability to channel the adrenaline and avoid ‘freezing up’. The object of all FAST courses is that the student should learn to experience and control difficult situations whilst under that adrenal stress. They work because each course firstly deals with the conditioning and reprogramming the brain to work whilst under the effects of adrenal stress, we call this ‘aggression therapy’ These effects can arise in a variety of places such as work, school, commuting or undertaking daily tasks. This initial phase of the course which accesses the psychology of the brain is the critical element. It is backed up with group dynamics, practising techniques and the opportunity to try out the skills for real. Real life scenarios created by the instructors enable the attendees to experience the adrenaline rush, experience the effects for themselves and put into practice all the tools and strategies taught during the course. The courses build a little at a time, so the attendee’s exposure to adrenal stress is increased as the course progresses. Until they finally face the Bulletman. The Bulletman – Who is this? Most of our courses involve the Bulletman! It comprises of a specially designed suit worn by our Instructors enabling the students on the course to really test out what they have practised. The Bulletman can take full power strikes to the appropriate targets giving the attendee a truly unique opportunity. THE BULLETMAN IS THE CLOSEST THING YOU’LL GET TO A REAL LIVE ATTACKER. Unfortunately, most people think ‘IT WILL NEVER HAPPEN TO ME’- That cannot be relied upon- by attending theses course you will greatly reduce the risk of it happening to you, however, if it does happen you will have the necessary tools to deal with the situation and stay safe. This is why you need to talk to us……. A lot of other self-defence groups have an inability to create a real-life situation as we have described above using the Hitmen, therefore giving the attendee a false sense of security. We don’t teach a myriad of fine motor skills that cannot be accessed when under stress, we tap into an area of learning that stays is stored in the part of your brain where all your emotional responses are stored, therefore this training stays with you for life, the same as all your other life-changing memories. How can I get on a course? 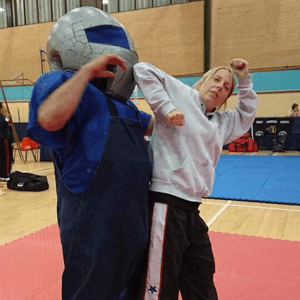 There is no need to join a martial arts programme to take advantage of our FAST Defence courses. Our basic course lasts approx 4 1/2 hrs, with lots of follow-on courses dealing with, weapons, multiple attackers, ground fighting and finally an opportunity to experience the ultimate purpose-built scenario centre. 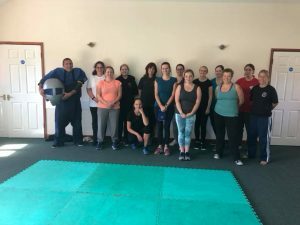 Our UK team is made up of highly motivated instructors, whose sole objective is to provide the best opportunity for everyone to realise their own abilities and gain the mindset and the power to fight for their own safety. We’re not here to show how good we are, but how good you are!